Not that the exhaust actually comes out of that grill, of course. And one should not overstate the pollution caused by buses. Measuring just the CO2 emissions, a diesel bus emits about 1800 grams per kilometre. By comparison a diesel Landrover emits 295 grams per kilometre. At an average 1.2 people per private vehicle, that’s 245 grams per passenger kilometre. So a bus has to be carrying just 8 passengers (which is comparatively empty for a bus) to be more efficient than a diesel Landrover (or about 22 people to be as efficient as a Prius). The number of people on a bus varies widely. It could be no passengers (just the driver), or if packed it could be 80-100. Some may catch it for many kilometres, some just a few stops. And of course, you can’t just run the services you know will be packed. You get more people onto PT as a whole if you have a cohesive network, running frequently, and covering the hours that most people travel, so they can rely on it to be there whenever they need it. Smartbus is proof that more buses gets more people using them. So while the advert (and specifically its placement) above may not have been a good idea, we do need more buses on the road. Note that one bus takes up less room on the road than 22 Prius cars. The radiator is behind that grill so there’s no pollution coming out of it. The exhaust pipe is below the back of the bus. The newest buses have Euro IV or Euro V engines and they would produce a lot less than 1800 g of CO2 per km. I estimate that they would consume diesel at a rate of about 18 l/100 km or perhaps less. 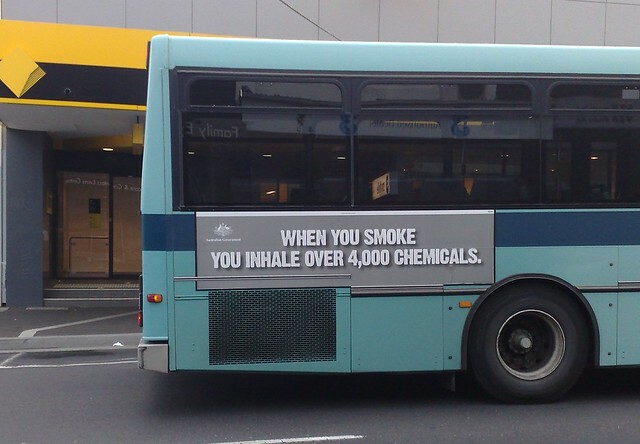 An old bus, from which you can see black exhaust smoke, might produce 1800 g/km though. I hate those adverts on busses and trams. I was beside 2 today that had ads for organ donation. Probably just as well considering the fumes I inhaled once they took off. HaHa. It’s not bad placement. It’s just funny. It could be worse. They could have placed it in stores right above the shelf for cigarettes. @Jennifer.. so you are in favour of exterminating the orang utan habitat so more oil palm plantation can be planted, then ? I used to be teased about using ‘advert’ (“It’s an ***ad***!!!”). I blamed it on my British Mum. @enno, I didn’t say that! I was stating a fact. @enno has a point though. Biofuels aren’t scalable. Converting the entire Australian wheat crop to ethanol production would, for example, only substitute for around 15% of Australia’s oil consumption. For non-hybrid diesel buses, the average in the US is 4 mpg, which is 1,570 g/km. US hybrids buses average about 5.3, which is 1,200 g/km. This assumes moderately bad urban congestion. In really bad traffic, buses emit more per km – but then again, so do cars. @Chelsea, that’s good placement! Might make people think before buying. Of course, CO2 is not the primary pollutant most people think about on a daily basis – and many buses in many cities do average less than 8 passengers over their whole run. Diesel is incredibly dirty – even the new ‘clean diesel’ is dirtier than the dirtiest US gas engines now legal for (new) sale – those particulates are what people are thinking about when they think ‘pollution’. Plus, I drive a Prius – even my CO2 emissions when driving alone beat the bus when it’s nearly full.